U.S. President Donald Trump speaks before signing an executive order directing federal agencies to recommend changes to a temporary visa program used to bring foreign workers to the United States to fill high-skilled jobs during a visit to Snap-On Inc., a tool manufacturer, in Kenosha, Wisconsin, April 18, 2017. U.S. President Donald Trump on Tuesday signed an executive order aimed at making it harder for companies to hire temporary foreign workers. The order, called "Buy American — Hire American," will take initial steps to reform the H1-B visa program. H1-Bs allow employers — mostly high-tech firms — to hire skilled foreign workers to work in the U.S. for three years. There are 85,000 slots available each year, 65,000 for applicants with bachelor's degrees and 20,000 for those with master's degrees or higher. "We are going to use a tool you all know very well. It's called the sledgehammer," Trump said Tuesday during a speech at Snap-on Tools, a company in Kenosha, Wisconsin. The administration will require companies to demonstrate that the visas are going only to the most highly skilled workers in their fields. "They [H1-Bs] should be given to the most skilled and highest-paid applicants and not be used to replace Americans," Trump said. The administration says the visas, which can be renewed once, have contributed to a slide in American wages; 80 percent of H1-B visa holders are paid less than the median wage in their fields. Howard University political science professor Ron Hira said the Trump administration is right: "The laws are loose, and so what happens is it's become a way for employers to bring in cheaper, indentured workers as opposed to filling those skills gaps. As a result, the program is oversubscribed, and it's actually undercutting Americans." When the application season opened for H1-Bs this month, federal offices were quickly flooded. As in recent years, there were so many applications that the U.S. government stopped accepting them within a week. Visa winners will be chosen by a computer-generated lottery. Hira also said the intent of the program is good in serving as a guest worker program for when there are shortages of American workers. What got in the way? Politics. Companies are making so much money, he said, that they are able to influence Congress to prevent changes in the H1-B program. And it's all legal. 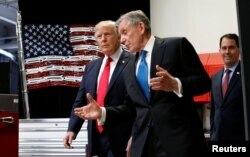 U.S. President Donald Trump tours the headquarters of Snap-On Inc. with CEO Nick Pinchuk as Wisconsin Governor Scott Walker follows, in Kenosha, Wisconsin, April 18, 2017. Hira said that if the sledgehammer seemed to be velvet-coated, that's because the executive order is not really intended to change policy so much as to guide policy changes. Federal agencies will have to implement it. "The idea behind the executive order is to make it merit-based, that the really highly skilled people get preference over the cheap labor that goes on," Hira said. Overwhelmingly, India has been the biggest recipient of H1-B visas. The Department of Homeland Security reports that 71 percent of H1-Bs went to Indians in 2015. China was a distant second with 10 percent of the visas. India's success is attributed to its huge outsourcing firms that submit thousands of applications every year, increasing their chances of winning the visa lottery. Outsourcing firms, which supply services to other companies, are controversial because they are not subject to a federal requirement that they not displace American workers if they pay the H1-Bs at least $60,000 a year. Hira said the new policy might help high-tech American companies at the expense of the outsourcing firms that abuse the system. But "expect the Indian government to lobby against the changes," he predicted. The executive order also called on all federal agencies to buy American. It established a 220-day review on waivers and exemptions to government "Buy American" rules. VOA's Mil Arcega contributed to this report.